Skirt and flank steaks are cooked the same way. Broil yours to the desired level of doneness and enjoy it in your favorite recipes. This version is a perfect starting place! Preheat the broiler on high. Move an oven rack as close to the broiler as possible. 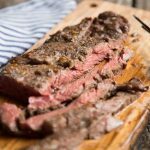 Remove the connective tissue and extra fat from one side of your steak using a knife and a paper towel. It's okay if you don't get it all off. Just get what you can. Transfer the steak to a foil-lined rimmed baking sheet. Cut the steak in half to make it fit if necessary. Drizzle over the oil and spread it around on both sides. Sprinkle evenly with salt and pepper. Place under the broiler (keep an eye on it!) and broil on the first side about 4 minutes depending on thickness of your steak. Skirt steaks will need much less time than a flank steak will. Turn the steaks over and broil 3 to 4 more minutes or use a meat thermometer to check the temperature and remove your steaks at your desired level of doneness. Allow your steaks to rest, lightly covered with foil for 10 minutes before slicing. Cut steaks against the grain--so across the lines of the meat--to ensure that each slice is tender.